Android Lollipop is rolling out very slowly to most users, and Motorola fans are no exception. 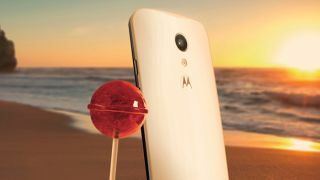 The company today confirmed that the first- and second-gen Moto G have received their Lollipop updates in India, as was previously rumored, as well as in Brazil, but what about the rest of the world? The company's latest blog post doesn't offer any predictions or promises, but it does try to explain why it takes so long for a new update to come out. "Though we try to make the process seem easy, it's actually pretty complicated," the post reads. "That's because we want to ensure a quality experience across every device that gets the upgrade." Apparently Lollipop is "the biggest and most ambitious" Android release to date, and even though Google reportedly "improved" the release process with this one, it's still a slow process. It begins when Google releases the new version of Android to the Android Open Source Project - the "public push," in other words - and Motorola and other device makers begin testing it on various devices and carriers. Motorola then releases updates to small groups for testing purposes before wider release commences. The company encourages users still waiting for updates on their devices to check its software upgrades portal regularly.